Where can this Diploma in Garden Design course take me? With a Diploma in Garden Design you can combine your design skills with a love of working outdoors. 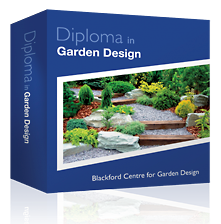 The Diploma will show you how to create a garden that expresses feeling and showcases your garden design expertise. You’ll learn about the best use of flowers, shrubs and trees and how each suits a particular climate. A qualification in garden design will allow you to set up as a self-employed garden designer working for individual clients or larger businesses. You could be designing the garden of a friend or neighbour, the town floral displays or an entire city park! You could find yourself designing all kinds of gardens, from traditional cottage gardens to modern and stylish. Once you’ve completed your Diploma you’ll be able to present your portfolio of ideas with confidence and professionalism.